Four or five corporate CEO’s have resigned from Trump’s Manufacturing Advisory Council out of protest against his de facto support for the white nationalists. 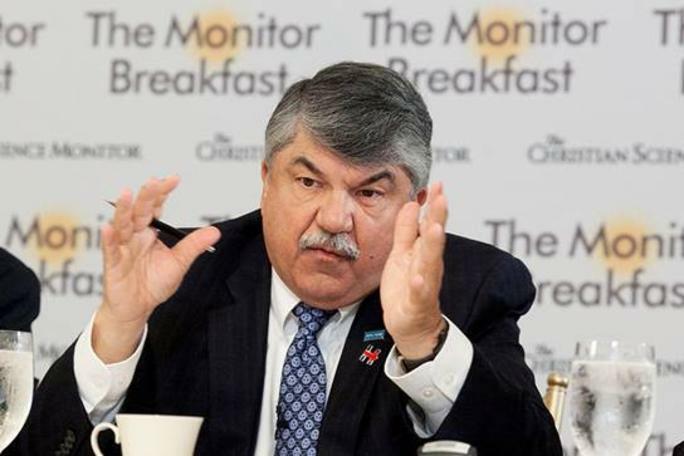 Guess who’s still on it: According to the NY Times Rich Trumka, president of the AFL-CIO and Thea Lee, Trumka’s chief of staff. So the corporate CEO’s are more advanced than the AFL-CIO officials! Local union members should put forward motions demanding that these two resign immediately, and have those resolutions sent to their union bodies (like regional councils, International’s, etc. ), the central labor council, etc. etc. Make anti-fascism and anti-racism international! And when we’re done with that, we’ll try closing the barn door after all the horses have fled. Think you’ve missed the entire point. I mean by that, the resolution should not be one demanding resignation from Trumps council, but rather that no worker should ever accept a position on a council advising the chief executive officer of the bourgeoisie’s government, or any other member of the bourgeoisie’s government; that no worker should ever agree to a position on a corporate board of directors. I agree. And that not only goes for committees like this, it also goes for political parties, such as the Democratic Party. But at the very least they could break with Trump at this point. If I believed in the power of prayer, then the one I’d be praying for is Trumka.